The Dell XPS 13 is still one of the best laptops you can buy, offering top performance, brilliant battery life and excellent build quality. However, in 2013, touchscreen technology is no longer an expensive luxury. It's the bread and butter of the Windows 8 experience, and Dell has let us down by not offering the option on its flagship Ultrabook. While we love the Dell XPS 13, we'd recommend holding off for a touchscreen version, or trying the Acer Aspire S7 if you want to get the most from Windows 8. 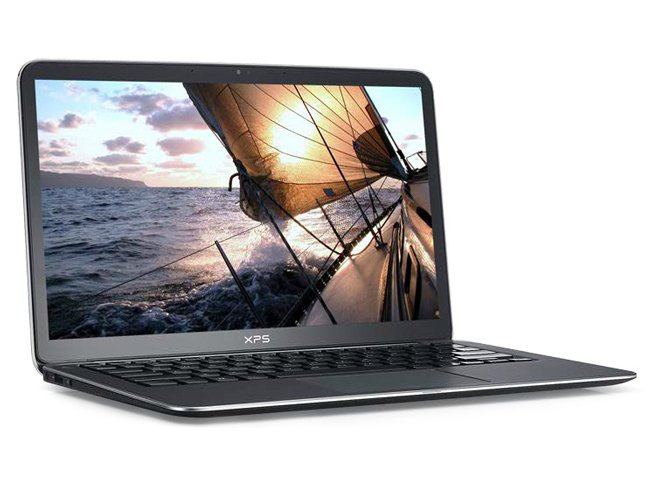 The Dell XPS 13 is a comfortable Ultrabook to use in all types of situations. It's light and small, so it won't take up much room in your briefcase or backpack. The keyboard is usable with the exception of a few keys, and the palm rejection on the touchpad is excellent. It is missing some features like a wired Ethernet port and HDMI that could make it a non-starter for some folks. The XPS 13 has a respectably long battery life of just over seven hours but other Ultrabooks can last even longer. The backlit keyboard is very comfortable thanks to its responsive keys that give just the right amount of feedback when pressed, although the cursor and Function keys are smaller than usual. Though the touchpad is large and accurate, it’s easy to accidentally brush against it when typing and inadvertently move the cursor and type text in to a random place in a document. The XPS 13 is something of an oddity in a market that’s quickly becoming a lynchpin in a so-called “post PC” world. Ultrabooks were originally conceived to be inexpensive, adaptable solutions that could be carried just about anywhere but typically, manufacturers have used them as flagship products which are anything but affordable for their intended clientele. Dell hat sich für sein XPS 13 Ultrabook viel Zeit gelassen. Wer ein Ultrabook sucht mit edlem Gehäuse, das einem Apple Mac Book Air versucht Paroli zu bieten, ist mit dem Dell XPS 13 Ultrabook gut bedient. Eine erweiterte Absicherung mit bis zu drei Jahren Service-Vor-Ort kostet 280 Euro, und eine Unfallschutz-Absicherung für ein Jahr wird zum Preis von 50 Euro angeboten. The Dell XPS 13 is a truly portable computing device where a great deal of attention has been paid to the aesthetics as well as to its features. The performance is snappy due to its fast hardware and you can be sure that it will not slow down even after months of usage, thanks to the fast SSD inside. Our only qualms about the gadget are due to poor viewing angles of the display and erratic behaviour of the touchpad. If you want to buy a something as portable as a MacBook Air but are short on cash, this is a worthy alternative despite its expensive pricing. However, for the vast majority of users, this will be an expensive proposition, so it's better to wait for the ultrabook prices to drop. Overall, we were impressed with the design and build quality of the XPS 13, but more I/O ports and a removable battery would make this a better bet for professional or business buyers. The Dell XPS 13 brings nothing new to the ultrabook market, as the basic performance shows. But what it does do, and with a lot of class, is an ultrabook form factor that’s desirable by many. You’re not stuck with different aspects of a design you may or may not appreciate. The XPS 13 is a class act from Dell, and if you ignore the rather liberal inspiration from the MacBook Air, then the aluminum chassis with carbon fiber composite base presents an aesthetically pleasing design. The light weight and 18mm – 6mm thickness is something that makes for an ideal ultrabook. Also, starting at $300 cheaper than a similarly specced MacBook Air, you can’t go wrong with the XPS 13 at all. Dell might have been late to the Ultrabook party, but the XPS 13 certainly makes a head-turning entrance with its superb design. It’s not faultless by any means - connectivity is limited, and it would have been nice to see a higher resolution screen - especially with the price tag it carries, but it's an impressive, speedy first attempt at the genre. Dell is last to market with its Ultrabook, but in many ways the XPS 13 has been worth the wait. With a 13.3in screen crammed into a 12in-equivalent body, it’s innovative and beautifully designed, combining attractive elegance with practical user comfort and good battery life. Build quality is superb and, thanks to its great backlit keyboard and lovely touchpad, usability is up there with the best. Unfortunately, connectivity suffers from the smaller chassis and the screen’s poor viewing angles really let the side down, meaning the similarly compact Samsung Series 9 900X3B is a far better proposition if you can afford the extra. If not, however, the Dell XPS 13 Ultrabook is a great premium option. In the final analysis, at $1,000, the XPS 13 is a good value in a market that is rapidly becoming as commoditized as the rest of the laptop space, but where fairly hefty prices still rule. As we would expect from an Ultrabook the initial impression users will get from the XPS 13 is one of a high quality build. The aluminium lid looks good and feels sturdy and well made with the carbon fibre sides adding a nice contrast while also offering durability. The system feels well balanced in use and of course with the dimensions of 0.71x12.4x8.1" and weight of 1.36KG it feels compact and light. The new Dell XPS 13 range starts from Rs.79,900, which is just too expensive for what’s on offer. Granted, it’s a very well put together Ultrabook and it has looks to die for, but once again, it’s really hard to ignore the big fat elephant in the room. If thin and light is your main concern, then Acer’s TimeLine X series offers very good value for money notebooks. It obviously doesn’t have aluminium and carbon fibre, but it gets the job done. Ultrabooks are very good alternative to netbooks, but not at these prices. When it's all said and done, the Dell XPS 13 is a desirable 13in Ultrabook. Its build quality and feel alone make it worthy of consideration. I would have liked built-in Gigabit Ethernet and an SD card slot (especially while travelling), but I can understand their omissions. An HDMI adapter will be required if you want to plug this notebook into your TV. From a design perspective, the XPS 13 is a fantastic addition to Dell's lineup, establishing a new bar that Dell should aim to clear with its future products. The laptop is attractive, solid, and fast. Battery life is good if you don't go crazy with the screen brightness. Audio is better than you'd expect, and the keyboard and trackpad (after the driver update) don't disappoint. With better display quality, it would be a slam-dunk. Unfortunately, the middling resolution, iffy color reproduction, and poor off-axis viewing leave a considerable stain on what would otherwise be a five-star product. Let's hope that Dell releases a revised version this summer that carries Intel's Ivy Bridge chips and a better display. They say imitation is the sincerest form of flattery; if that's the case, Apple should be proud because the XPS 13 looks a lot like a MacBook Air. Having said that, we do like the unique touches Dell has incorporated into their design. We loved the smaller form factor and the soft-touch wrist pad and, while it wasn't all that impressive, the carbon fiber base plate did at least prove to be equal, if not slightly better, than aluminum as a build material. The Dell XPS 13 Ultrabook is an impressive notebook that delivers a lot in a small package, especially at $999. If the trackpad was as good as that on the Macbook Air I would say that Dell had bested Apple in that price range, but sadly that’s not the case. Even though the XPS 13 carries the same size display as the 13 inch MacBook Air, the $300 price difference and the higher resolution of the Air put the two at opposite ends of the spectrum. Dell's first entry into the ultrabook market is a patient and smart one. They've arrived at the party a bit later than the competition, but they're fashionably late: instead of a design that just apes the Apple MacBook Air, Dell has taken care to produce something unique to them with the XPS 13. The Dell XPS 13 has become one of our top Ultrabook picks. You really can't go wrong with most first gen Ultrabooks since they share similar specs and shoot for higher end appointments, but Dell has a winner with their combination of premium materials, excellent performance and great looks. The XPS 13 is extremely sturdy yet slim, uses innovative materials like carbon fiber and a Gorilla Glass display and is the most compact 13" Ultrabook so far. Dell uses premium parts like Intel Advanced N-6230 wireless and Samsung's fast PM830 SSD, while the competitors often go with lesser parts to keep costs down. This is a fast Ultrabook with a very good backlit keyboard and a pleasing display, even if we wish there were an IPS option. Recommended. From the moment it comes out of the box the XPS 13 looks and feels like a truly premium product and, with a nice keyboard and respectable performance, it's a nice machine to use, too. But, the display suffers the same complaints we've seen with other Ultrabooks in this price range -- middling resolution, poor off-angle contrast -- and the trackpad only works well when it feels like it. In recent months, we've heard a whole bee colony's worth of buzz around ultrabooks—2012's new breed of super-thin, powerful laptops—from both the concept's initiator (chip maker Intel) and practically the whole wide world of laptop vendors. Anyone shopping for an ultrabook should consider the well-rounded $999 version of the XPS 13, a 13.3-inch-screened model with stellar build quality and competitive performance at a fair price. Dell's entry into the ultrabook market may be fairly late but it was definitely well thought out. By taking their time, Dell has refined their design to offer an extremely compact design that uses the full ultrabook specification including Intel Smart Connect Technology. Performance is very fast with boot and wake times that are some of the fastest ever thanks to the high speed solid state drive included with it. The Dell XPS 13 is a 13-inch ultrabook that is extremely good-looking and sturdy. While it is entering both a crowded and emerging category of computers, it does a lot of set itself apart from the rest of the pack. It has an extremely thin footprint, a glass-covered screen and an SSD hard drive. A good friend of ours said the Dell XPS 13 is an ultrabook that "could steal customers from Apple." That may be a stretch, depending on your point of view, but we'd definitely say the Dell XPS 13 is seriously tough competition for any manufacturer in the ultralight notebook space, Apple or otherwise. There will be a flood of new ultrabooks coming with the arrival of Intel's "Ivy Bridge" processor update this year, but Dell has set the bar very high without needing new silicon. If it had just one or two of the missing ports we groused about—say HDMI and a card reader—the Dell XPS 13 would be spectacular; as is, if you don't mind carrying a dongle or two, it's an ultra-small, ultra-sophisticated choice that shoots to the top of ultrabook shopping lists. The first Very Important Laptop of 2012 has arrived, in the form of the new Dell XPS 13. This is Dell's first ultrabook and even though the company is a little late to that particular game, the XPS 13 nails a lot of what makes for a good ultrabook experience. Dell packs a 13-inch display into a very small footprint in the XPS 13 ultrabook, making it one of the few slim laptops that actually tops the MacBook Air in some areas. From its stylish and compact carbon-fiber design to the backlit keyboard to its fast SSD, there's a lot to like about the $999 Dell XPS 13. Intel's Smart Connect technology is yet another plus, which will help you get right back to work when you lift the lid. However, the lack of an SD card slot and the below-average battery life detract from what is otherwise an excellent system. Overall, Dell has delivered a solid Ultrabook for $300 less than the MacBook Air. It should find plenty of takers. After spending an afternoon with the XPS 13, my opinion is just as favorable as it was when I first laid eyes on it at the start of the year. It’s a system that is so un-Dell-like (and I mean that in the best possible way) that I’ve actually carried it around the office to show it to coworkers, most of whom are similarly impressed. I reserve final judgement until I get some hard performance numbers and spend a lot more time with it, but for now, it feels like the only thing stopping me from running out and buying one myself is the knowledge that Intel’s Ivy Bridge chips will be shipping in a few months, and I really want a laptop with one of those. We feel this is easily one of the strongest Ultrabooks in the current line-up and a spectacular piece of engineering from Dell. We'll bring you more info as soon as we've had the final retail model on our test bench, as well as a confirmed retail price. The overall design and feel of the XPS 13 is certainly premium and the inclusion of a larger 13.3in screen in an 11in form factor is something which makes it a very appealing prospect - but we'll reservce final judgement until we get one into the office for testing. The Dell XPS 13 will be available in the US next month with prices starting at $999 (Core i5, 128GB SSD, 4GB RAM) and will be available elsewhere in March, with UK info yet to be released. Obviously we didn't get to test the Dell XPS 13 out in the wild or give all of its features a thorough run-through but in our limited time with the new ultrabook we were certainly impressed. The minimal design and lack of stickers around the keyboard give the product a very slick finish and the wafer-thin profile and featherlight weight are strong selling points. Positive: Excellent design; Protected display with Corning Gorilla Glass; Performance; Light weight. Negative: No memory card reader. Positive: Excellent keyboard; compact; quality processing. Negative: Noisy cooling; no card reader. Positive: Tough with carbon basis; Durable battery; Extremely fast start; Good sound ; Comfortable keyboard and touchpad; Gorilla Glass screen protection, thin frame. Negative: No media card slot. 79.27%: This rating is not convincing. The laptop is evaluated below average, this is not really a recommendation for purchase.